Amazing, fascinating, entertaining, smart, clever, playful, curious, and human-like are all words that describe the squirrels commonly found in our neighborhoods. A closer look at squirrels reveals that each squirrel has its own personality. Some are outgoing, some shy, and some bold. Anyone who has worked in a wildlife rehabilitation center has seen baby squirrels clasp their “bottle” (a syringe filled with formula) with their tiny paws, much like human babies. Those who witness this special scene always have a soft spot in their hearts for squirrels and never view them as pests. If you have squirrels, you probably have trees. If the trees have nuts or fruit that squirrels like, squirrels will be especially attracted. The easiest way to deal with squirrels is to work out a way to live harmoniously with them. Even if you use deterrents, expect that they will eat some of the foods that you might grow on or near their trees. If the squirrels inhabiting our trees were somehow to disappear, there would soon be other squirrels attracted to our trees. Squirrels don’t hurt us, and their behavior can fascinate both children and adults. Squirrels have an important place in our neighborhood ecosystems. Are squirrels eating your plants? Squirrels are active only during the day. If unwanted activity is occurring at night, your visitor is another species of animal. 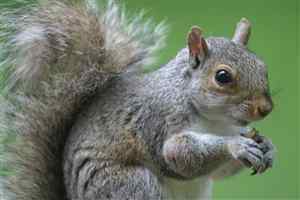 Squirrels rarely do significant damage to plants and trees, actually preferring food that humans don’t eat, such as acorns. They may eat some buds, fruits and bulbs in the spring and instinctively bury nuts in the fall. Do you have an oak or nut tree? Why not share it with the squirrels? Nuts and acorns are favorite foods of squirrels, and if you have trees that bear nuts and acorns you can enjoy watching the antics of squirrels in your own yard. Remember that squirrels and other wildlife must find all their food in nature. There are no supermarkets for wildlife. If people are not feeding squirrels, the natural habitat in your neighborhood will support only a given number of squirrels. The ecological balance will be maintained naturally. Squirrels are instinctively attracted to trees for their very survival, for much of their food, and for nesting. Deterring them from specific trees is an ongoing challenge. Spraying squirrels with water from a hose may work for a while. Eventually, the squirrels will run away when they see you pick up the hose or even move toward it. Tie a 2-foot band of sheet metal around the trunk of the tree about 6 feet off the ground. Make sure that there are no nearby launching sites from which they can jump to the tree. Never use sticky substances designed to trap animals permanently when they touch or walk on them. Sticky substances and glue traps are very inhumane. Terrified animals sometimes tear off their legs and skin trying to escape. Sticky substances and glue traps also put pets, birds, and other wildlife at risk of getting fatally stuck. Chicken wire is unobtrusive and bendable and can solve many squirrel issues. Place ordinary chicken wire over plants and on the ground’s surface where squirrels are digging to store food for the winter. The openings in the wire will be big enough for plants to grow through. Wherever unwanted squirrel gnawing is discovered, a piece of chicken wire can be used, even on the top of a gate or over roof shingles. Smooth rocks placed around plants in the ground or in pots look attractive and will deter squirrels from burying their treasures in that location. Bird netting is notorious for trapping and entangling night visitors such as skunks, raccoons, and opossums, causing them great distress. Imagine how challenging it would be to free a skunk or raccoon who becomes trapped under the netting. Freeing a squirrel is equally challenging! Grate Irish Spring soap with a cheese grater, and sprinkle it lightly through your garden. Mix a small bottle of hot sauce, a teaspoon of dish soap, and a gallon of water and spray the mixture onto ornamental plants that humans don’t eat. After a rain the hot sauce must be reapplied. Plant daffodils. They are often ignored by squirrels. Use chicken wire first. If necessary, try bitter tasting deterrents that are registered for repelling squirrels. Products that contain thiram are for soaking bulbs prior to planting them, and products that contain capsaicin or oil of mustard are for spraying on plants. The products’ labels will reveal which repellents can be used on edible plants. Many baby squirrels are victims of ill-timed tree trimming. In the Northern Hemisphere trim trees in late November, December, and early January when squirrels and most birds are not nesting, not during spring, summer, and early fall, when squirrels and birds are having young. In the Southern Hemisphere, trim trees in months when squirrels and birds are not nesting. If you absolutely must trim a tree during squirrel and bird nesting season, please examine the tree carefully to make sure that you avoid squirrel nests and bird nests. Leave plenty of foliage around the nests so that the young squirrels and birds will not be exposed to predators and the hot sun. Please share this information with your gardener. Especially during nesting season squirrels dart back and forth across streets. Remember, if a squirrel mother is killed, her babies will starve to death or be eaten by predators. When crossing the road, squirrels’ instinct is to dart back and forth to elude predators, which include vehicles. Squirrels can change direction suddenly and dart back into traffic. If you spot a squirrel in or near the road, reduce speed so that you can easily and quickly stop. Squirrel mothers seek warm, dry places for their nests, sometimes other than trees. They may enlarge openings in roofs to find a suitable place, unfortunately causing some damage to your home. It is best to let the mother squirrel raise her babies before trying to chase them all out. When the babies are teenagers (at about 13 weeks), you can repel the squirrel family by playing a radio loudly or banging on the bottom of a metal pot. The mother squirrel may decide to transfer her babies to another nest, as she usually has a backup elsewhere. This process may take 3-5 days. Never separate a mother squirrel from her babies, and give her time to relocate them. To be sure the squirrel family has left, listen and watch for 5-6 days before sealing the access holes where they entered in your attic and foundation areas. You may want to place a Havahart trap (humane, live trap) in the sealed area for a week or two to ensure that no other squirrels remain inside. Check it daily, and release any trapped squirrels outdoors on your property during the day. Young squirrels are adventurous and sometimes fall into uncapped chimneys. At other times, adult squirrels seeking shelter may try to nest in the chimney or house. If it is squirrel nesting season (spring, summer, or early fall) and you suspect that the noise you hear is a squirrel family that is nesting in your chimney rather than a single squirrel who has fallen into it, wait until nesting season is over before disturbing the squirrels and capping your chimney. A squirrel that accidentally finds itself in your house during the day is often frightened and confused. Be sure to remain calm and move slowly. Make it easy for the squirrel to exit by closing interior doors and opening exterior doors and windows. Stay out of sight so the squirrel can focus on leaving, which it will soon do. If you want the squirrel to drop down your chimney into the fireplace, place a box lined with something soft for him or her to land in. Here’s how to avoid having a frightened, soot-covered squirrel race through your home. Before the squirrel drops into your fireplace make a tunnel from the fireplace to the nearest outdoor exit by lining up backs of chairs and draping them with sheets that reach the floor. Then after dropping into the fireplace the squirrel will immediately see daylight through the open exit door and will run toward it and out. Another method is to tie securely a 3/4” or thicker rope to the chimney on the roof and let it dangle down into the fireplace, thus providing the squirrel a way to escape. However, you’ll need to make a tunnel as described above with this method, too, as the squirrel may scamper down the rope into the fireplace rather than up. Install a cap and screen on the chimney. Never try to smoke out any animal. You may wish to contact your local wildlife rehabilitation center, National Wildlife Rehabilitators Association, wildliferehabber.org, or an experienced chimney sweep for advice and help. There are several styles of bird feeders that supposedly deter squirrels. Nevertheless, squirrels usually figure out how to reach the seed. Feeders must be positioned at least 10 feet from any launching point. One simple strategy is to place a length of plastic tubing around the wire from which the bird feeder is suspended. The tube will spin when the squirrel tries to walk on it. It is important to allow squirrels, birds, and other wild animals to find their own food in nature. Therefore, you may want to consider removing the bird feeders and having birdbaths instead. Birds need fresh, clean water all year long. Bird feeders can present problems. Spilled birdseed from a feeder can attract rats and other wild creatures. Sick birds that use feeders can spread diseases. Clusters of birds at bird feeders can attract hawks that prey upon the birds as they eat. Birdbaths that are cleaned and refilled regularly with fresh water provide a much healthier attraction for birds throughout the entire year. A squirrel gets into your house. A squirrel that accidentally finds itself in your house during the day is frightened and confused. Be sure to remain calm and move slowly. Make it easy for the squirrel to exit during the day by closing interior doors and opening exterior doors and windows. Stay out of sight so the squirrel can focus on leaving, which it will soon do. Found a young or injured squirrel? If you find a very young squirrel on the ground, call your local wildlife rehabilitation center and ask for advice. If a young squirrel is in its adolescent stage and is not injured, leaving it for one hour (under your constantly watchful eye for predators) at the base of its tree will allow its mother to retrieve it and take it back to its nest. Stay at a comfortable distance from the tree to avoid frightening its mother. If the young squirrel is injured, it can be taken to your local wildlife rehabilitation center: National Wildlife Rehabilitators Association or wildliferehabber.org. Squirrels have had to adapt to the shrinking of their natural habitat. They struggle to raise their families in a world that gives them less than full respect. Understanding and appreciating them can make a big difference in their lives and ours.